Should Parents Worry if Baby Teeth Aren’t Falling Out? When parents visit Affiliated Orthodontics, it is not uncommon for parents to worry if their child’s baby teeth do not fall out on time. Infants rollover, sit, walk, and talk at different stages of their development. The same is true when your child is losing baby teeth. There are some developmental issues which require professional attention, but in general, what should parents expect when their kids start losing baby teeth? The first baby teeth are usually lost at about six years of age. Some kids may lose theirs as early as five or as late as seven, which is still considered normal. The average child will have lost eight baby teeth by age eight; four front teeth on top and four front teeth on the bottom. Between 8-10 you will normally not see much loss or eruption of teeth. During this two-year “break” interceptive orthodontic treatment may be indicated. This is why the American Association of Orthodontics recommends that all children be evaluated by age 7. This allows Dr. Davis and Dr. Womack to determine if your child’s teeth and jaws are developing correctly and intervene with recommendations or treatment, if indicated. Around ten years of age the remaining teeth begin to fall out. The average adolescent loses all their baby teeth before 13. 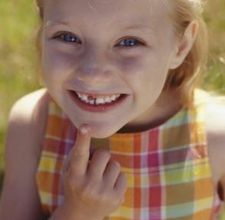 Girls often lose their teeth faster than the boys and sometimes as early as 11. The 12-year or 2nd molars start to make their appearance during this time. Third molars will begin to develop around age 16 and more often than not, need to be removed due to lack of space in the dental arch to accommodate the teeth. X-rays at this age are recommended to determine if there is enough room for third molars before the roots fully develop to make extraction easier if required. There is not enough room for permanent teeth causing crowding. They may not be able to push out the overlying baby teeth. Congenitally missing permanent teeth. Baby teeth with no underlying permanent replacements may be retained indefinitely. Extra teeth can block the normal eruption of permanent ones. With a simple x-ray, your orthodontist can tell you if there really is a problem or if your child is just developing slowly. An important service Affiliated Orthodontics provides is monitoring the dental development of your child’s dentition and make recommendations regarding baby teeth to encourage proper tooth eruption and jaw development during growth. Baby teeth preserve space for permanent teeth until they are developed enough to come in. If the baby teeth come out too early, space can be lost causing crowding of the underlying permanent ones. At the other end, baby teeth that are not lost on time can force the permanent ones to come in crooked creating a more difficult orthodontic condition. If the teeth are crowded, your child may lose two baby teeth naturally to accommodate the eruption of a single larger permanent tooth. If baby teeth are lost prematurely due to an accident or decay, an orthodontist should be consulted to see if a space maintainer is needed. Contact our office for a complimentary new patient exam to determine if your child’s teeth are developing normally. Feel free to ask questions or make comments in the area below.